Dont you just hate having to peel garlic it is a hassle sticky shelling is still on it and then did I say it correctly I just it’s ccomplicated, I am a member of a site call Tomoson.com. 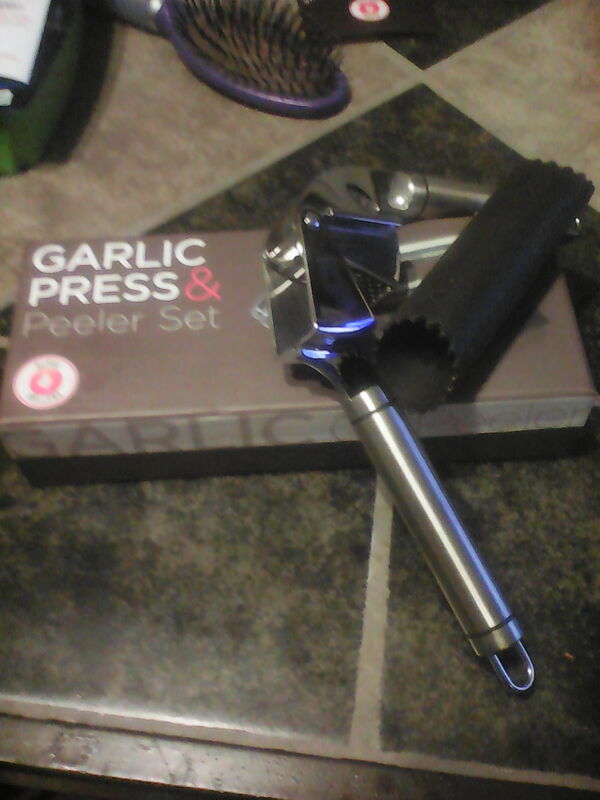 I applied to try out and review the garlic press an peeler set. I was amazed to be chosen to try out outstanding device. it comes in a nice box inside is a silky material to keep the device after washing. How to use this is the price the piece of garlic inside the device. Then you close and together and it peels it and dices it for you. My brother in law loves the cook and when he bases up the garlic and chops it up it takes him at least 20 minutes with this device it cuts half the time within 5 minutes I am looking to get if you more this with family members or fri have and everyone’s this is a must have and everyone’s kitchen. I was pleasantly please to be able to do it’s amazing pillar the only downfall is it is when he dices the little hole you have to slip the peeler will you put the garlic in to scrape out to get the excess go out. I want to thank Tomoson and alpha grillers. The opportunity send free for me to review.